In the era of globalisation Machine Translation (MT) has become an important facility for international communication. This work aims to present a brief historical overview of MT, its evaluation and the analysis of the Machine Translation output. Chapter One focuses on the major events, ideas and approaches in the history of Machine Translation whose influences are visible in the field nowadays. Additionally, it investigates the state of the art in the field. Chapter Two is an attempt to present the human and automatic methods of evaluation of Machine Translation systems and engines and describes strong and weak points of each method. 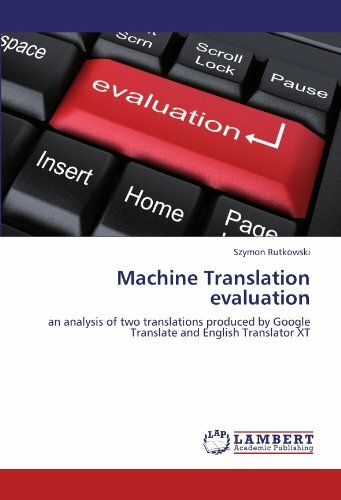 Chapter Three is devoted to the author's analysis of the output of two English-Polish MT systems namely Techland's English Translator XT and Google's Google Translate. Szymon is a second-degree student of English Philology at Kazimierz Wielki University in Bydgoszcz, Poland. He is fascinated by Machine Translation as well as by Computer-aided Translation. Szymon also works as an English-Polish translator.